Heat the oil in a deep-fat fryer or deep saucepan to 180°C or until a cube of bread dropped in turns golden in about 30 seconds. Meanwhile, top and tail the pineapple. Cut away its skin and remove any of the eyes. Cut the pineapple into 1cm-thick slices. Remove the tough core with an apple corer. Halve the slices if large. Sift the flour into a large mixing bowl. Slowly whisk in enough sparkling water to make a very thick batter. Leave to stand for 5 minutes, then whisk in the remaining water to form a smooth, thickish batter. Pat dry the pineapple rings on kitchen paper. Dip a third of them into the batter and, once thoroughly coated, drop into the hot oil. Cook for about 4 minutes or until crisp and golden, then drain on kitchen paper and sprinkle liberally with caster sugar. Repeat until all the pineapple has been cooked. Serve the fritters warm, with passion fruit ice cream. 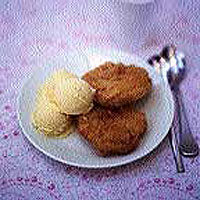 This recipe was first published in March 2004.